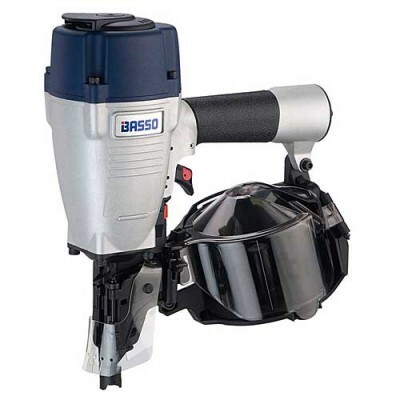 Coil nailer C29/65-C1 by Kit-Pro Basso® is a powerful and well balanced coil nailer with a compact body. This nailer fires both wire welded and plastic collated coil nails with a shank diameter of 2,1 - 2,9 mm on flat and conical coils. Coil nail with ring shaft Diameter shaft: ø 2,50 mm Length: 50 mm Qty: 9.900 pcs per box .. Coil nail with ring shaft Diameter shaft: ø 2,50 mm Length: 64 mm Qty: 9.000 pcs per box .. Coil nail with ring shaft Diameter shaft: ø 2,50 mm Length: 75 mm Qty: 6.000 pcs per box .. Coil nail with plain shaft Diameter shaft: ø 2,50 mm Length: 75 mm Qty: 6.000 pcs per box ..